In the opening flash-forward, detectives question a distraught Annalise. She’s not at all happy about the implication that she might a murder suspect, but if they knew Annalise like we know do, it’s not such a farfetched idea. “Arrest me!” she yells, inviting the cops to leap if they’re feeling froggy. In the present timeline, Nate and Annalise are lying in bed. He gets up to shower, and she chooses a pretty silly time to check her secret phone. Girl, he has a job! You can’t wait an hour to call your dead contact? A deeply upset and bloodied Frank answers her call. In between sobs, Frank tells Annalise that he had no choice but to kill her PI. Annalise quickly hangs up as Nate reenters the room. She gets another call, this time to her main phone from the university president’s office. As Annalise sits down with president Hargrove and some no-fun HR rep, they inform her that they are launching a formal investigation into the “killer” fliers around campus. That would be helpful, thanks. On her way out of the meeting, Annalise runs into Wes and, probably out of fear of Frank’s return, she invites him to move into her house. This is not smart! Scrawny little Wes can’t protect you from Frank! Showing some sense, Wes declines, citing his relationship with Maggie that no other character on this show seems to respect. Laurel shows up at Annalise’s home, purportedly to check on Wes’s status as a suspect in his father’s murder, but really her thirsty self is just trying to find out if Bonnie has heard from Frank. Annalise walks in on Bonnie and Laurel whispering, but she’s too preoccupied to grill them like she normally would. She heads up to her room to destroy the phone. Good idea, Annalise! After all, Frank just staged a car crash to cover up the PI’s murder, and she really doesn’t need evidence just chilling in her house. Even though they’re broken up, Oliver and Connor are still living together. Yes, it’s awkward as hell. During Annalise’s lecture, she introduces Oliver to the class as the tech expert for use on their cases. He interjects with an “as long as it’s legal” caveat for no good reason. We already know you have no problem doing illegal stuff, boo! You only have this job because you used your expertise to permanently alter the future of a man you don’t even want to be with anymore. This week’s legal clinic case involves Irene Crowley, a woman who was convicted of murdering her husband some years back. Irene is up for parole and Annalise wants to represent her because she was a victim of domestic abuse at the hands of her husband, so a change in the laws may allow for her release. Connor wins first chair despite his attempts to sabotage himself. Irene is a very difficult, stubborn client, so he’s gonna need all the luck in the world. Annalise finally uses good sense and asks Nate to help track Frank. When asked why, she leaves out the fact that Frank has been hella murderous lately, and instead suggests that she knows Frank to be a dangerous dude because she read his files when he was Sam’s psych patient in prison. Uh, what?! Did we know that Sam picked this dude up at the penitentiary? I suppose that’s a good place for a creepy dude to land a super-loyal hit man. Nate is rightly upset with for Annalise keeping Frank around, and for that whole “you used a dangerous hit man to frame me” thing. Still, Nate agrees to track Frank. Dude! What kind of Stockholm syndrome black love is this? You don’t need this nonsense. Get you a Michelle to complement your Barack! A newly invigorated Connor is at Irene’s parole hearing, but he has an emotional outburst when he sees the lack of compassion from the all-male parole board. In the middle of Connor’s post-hearing freak-out, Annalise meets up with Nate. He’s learned that Frank is in Wichita, much to her relief. She heads back to the hearing, where she overhears Connor confessing to murder in an attempt to inspire Irene to be forthright in her testimony. Boy, what? I know the situation with Oliver has you all messed up right now, but snitching on yourself is not the smartest strategy. Annalise gets him all the way together for his nonsense. After Irene gives a stirring testimony about the abuse she suffered, Annalise corners Irene’s sister in law and convinces her not to testify. The tactic works, and Irene is granted parole. Good! President Hargrove calls Annalise to give her the results of the investigation. Because of bad publicity and pressure from alumni, they’ve decided to suspend Annalise until everything dies down. But Annalise ain’t having that nonsense. SHE’S the victim. Do you really want to suspend her while she’s being harassed? NO. Yes, she’s also a killer, but they don’t know that! 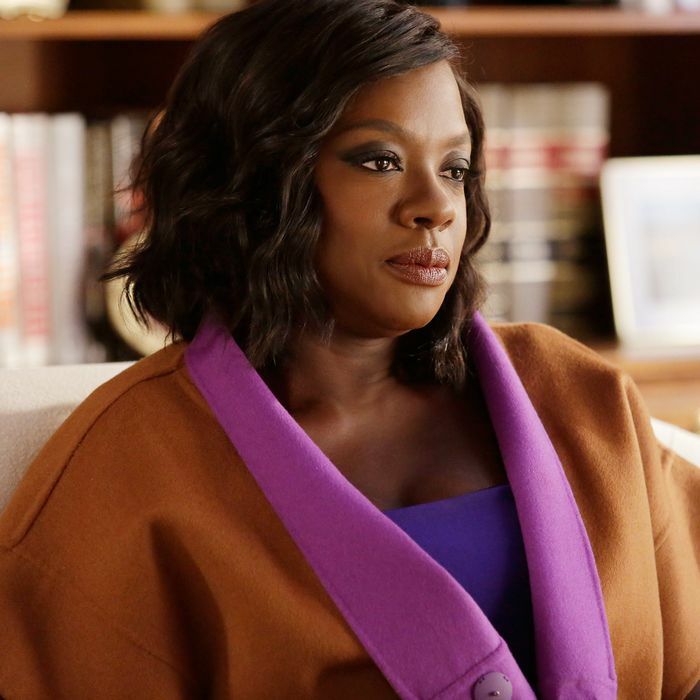 Annalise threatens to sue the school, announcing, “Lock me out of the classroom, but you can’t keep me from teaching my students.” She storms out. Let them know, girl. Back at Oliver’s apartment, he and Connor share a kiss. Connor tries his hardest to win his ex-boyfriend back, but Oliver is insistent upon staying broken up, begging Connor to let him go. Connor finally accepts the end of his relationship, packing up for Michaela’s place to crash. She’s not alone, though. Michaela had been trying to resist an emotional connection with Asher, disgusted by his white privilege and sense of entitlement. Unfortunately, Asher’s final pitch — that their common experience working for Annalise unites them despite their vastly different backgrounds — seems to work. Michaela tells Connor that she and Asher are screwing, but this depressed boy is too exhausted to care. Bonnie, who had grown suspicious of Laurel after her visit, does some investigating and discovers that Laurel had been calling Frank all summer. After promising Annalise she’d handle it, Bonnie takes Laurel to a pool hall, where she warns her about Frank. “I know about Lila!” Laurel protests. “There are worse things than murder,” Bonnie responds. I’m waiting for her to tell me what, though, because I can’t think of anything. Bonnie tells Laurel to kill her Frank fantasy. Uh-oh: Nate was mistaken about Frank’s location, since he’s been using a device that falsifies his location. This information terrifies Annalise, and Nate promises to stay at her place for a while. Makes sense to me. He’s a big, powerful police officer, not some scrawny 2L on a bike. Annalise and Bonnie have Laurel leave Frank a voice-mail to lure him out of hiding. I can’t imagine this will work on a genius hit man, but what I do know? We flash-forward once more to the scene outside of Annalise’s burning house, where Oliver makes his way through the crowd to reach Annalise standing near the ambulance. So, Oliver is not the dead body. My theory that president Hargrove is the victim makes it through another episode! Annalise pulls a phone from her jacket pocket and discreetly hands it to Oliver, instructing him to wipe it clean just as she is cuffed and led away by the cops. Whew. This is intense and it’s only the second episode of the season! Given that Oliver is very much alive, whose body do you think is in the ambulance? Will Frank come out of hiding because of Laurel’s voice-mail? When will the university learn that you can’t keep Annalise down? Let me know what you think in the comments!